Dr.VRK College of Engineering & Technology is run by Dr.V.R.K Educational Society. This college provide quality education in field of Engineering. Here, I am providing step to download Application Form of VRK College of Engineering and Technology. â€¢	Firstly go to the official website of the university. â€¢	Now on this page at the left mid side you will find a section of Admission and click it. â€¢	Now you will be directed to the next page which looks like the option â€œDOWNLOAD APPLICATION FORMâ€�. â€¢	Now, you click this option you get a Microsoft word file. â€¢	Now. you click ok option then you get it. Now on this page fill the required information and you will get the admission. Dr.V.R.K. College of Engineering & Technology is located at Ramanapet. The College runs three - 4 year degree courses. Electronics & Communication Engineering (ECE). 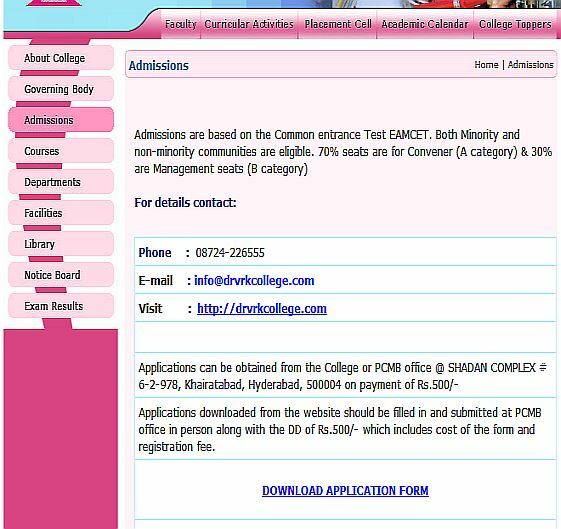 Admissions are based on the Common entrance Test EAMCET. Both Minority and non-minority communities are eligible.